About a year ago, I noticed a water mark on the ceiling of the front hall. Upon further investigation, we discovered the bathtub in our master bathroom had a leak. Since the bathroom was old and in need of a major update, I didn't want to spend ANY money fixing the repair. What we needed was a new bathroom! After many discussions, my husband finally agreed and so we decided the new bathroom would be moved to an adjacent room leaving the old bathroom space empty. This space was the perfect spot for a dressing room for me. Everything was ripped back to the studs just waiting for organization, clothes and accessories. I found my inspiration in a magazine. 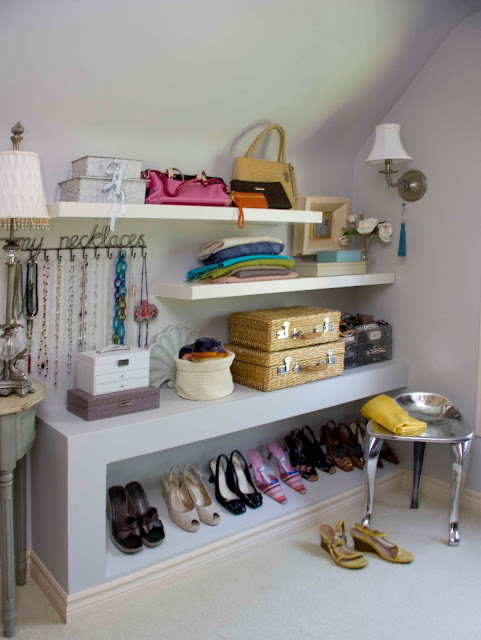 I loved the open shelves and thought they would be perfect for my purse and shoe collection. 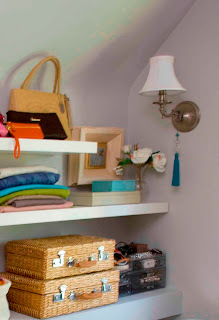 The alcove that held the tub was the perfect place for a rod to hold off- season clothes hidden behind drapery panels. My contractor had to work with a sloped area under what was the sink and built a perfect spot to house my shoes. I bought 2 Lack wall shelves in white from Ikea and hung them in an offset pattern. One of my favorite items is 'My Necklaces' hook. 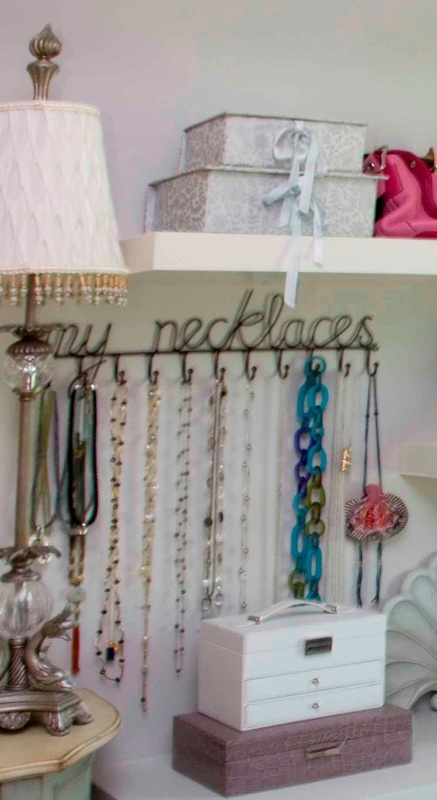 With 11 hooks, I can hang many of my long necklaces where I can see them and they don't get tangled. I love to look at them on display. 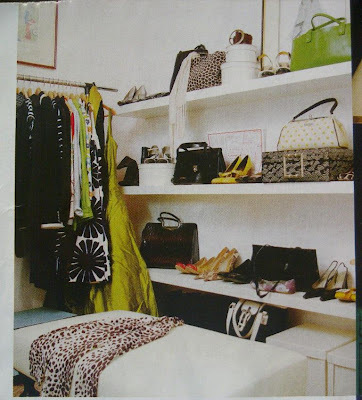 Other jewellery is stored in stacked jewellery boxes. Wicker suitcases are an attractive storage solution for scarves and evening purses. I also hung some art work and often have flowers on display as well. 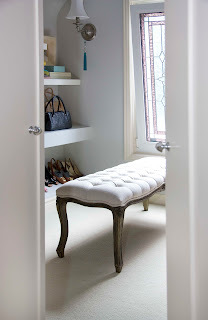 A beautiful tufted bench sits in the middle and is a perfect perch when deciding what to wear or putting on shoes. I love my dressing room - a bathroom leak has never made me so happy!